The title is a bit of a pun. I made several more of the "square in a square" blocks. But I have decided to go a bit "folksy" with it. 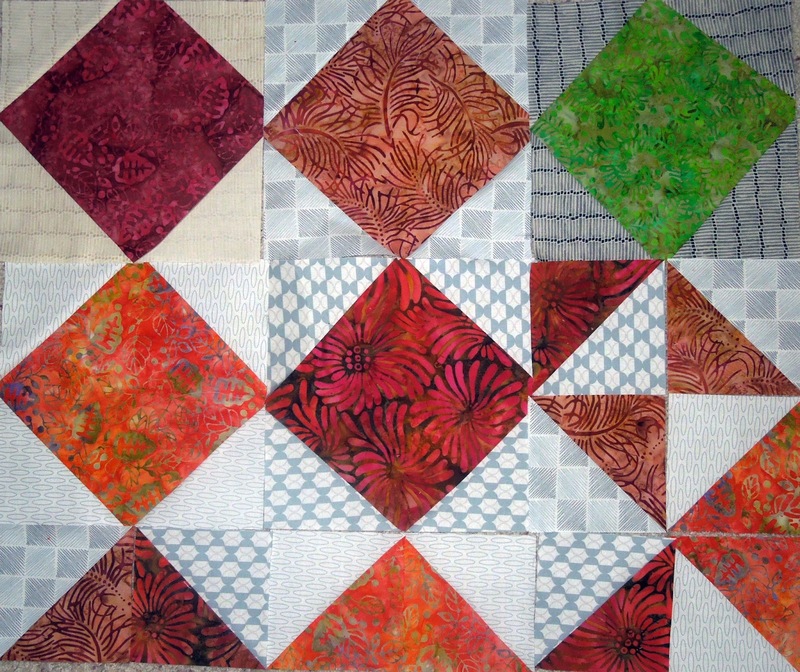 I am cutting the blocks down to nine inches square and loosing all of the points. The "quilt police" insist that your points be "perfect." Ha! So I decided to make my blocks pointless. I used more layer cake squares and some turnover pieces. But some of the layer cake squares were cut into fourths to cover corners. I have five squares and ten "bonus" pieces. Yikes! the bonus pieces have points? I will have to solve that problem. Ha ha...I already have a plan. Oh and if you are "doing the math" and wondering about the number of bonus pieces - two of them aren't shown as I don't know if I will use them. They had "oops" cuts made on them. Of course, with the "plan" I may still be able to use them. I love your autumny colors! Me, doing the math?! Lol, not likely. That gives me a hurty head, so I just appreciate the overall look. I have never heard of "pointless" anything, but I surely have created a few! Love it, Gene. Looking good to me so far. I've done this before. It is fun to just sew and figure things out as you go. Have fun playing!